The kitchen has moved beyond being simply a space where the meals are prepared. It has become the focal point of many houses as an entertaining area, place for the family to gather, and a choice spot to do homework or other projects. The variety of activities that can take place in the kitchen have their own lighting requirements. For example, the lively environment of a cocktail party where drinks are being poured and food is served lends itself to a brighter atmosphere with use of all the layered lighting available in the space. By contrast, a quiet evening watching television may require the singular use of a suspended linear light over the kitchen bench for an ambient glow in the background. 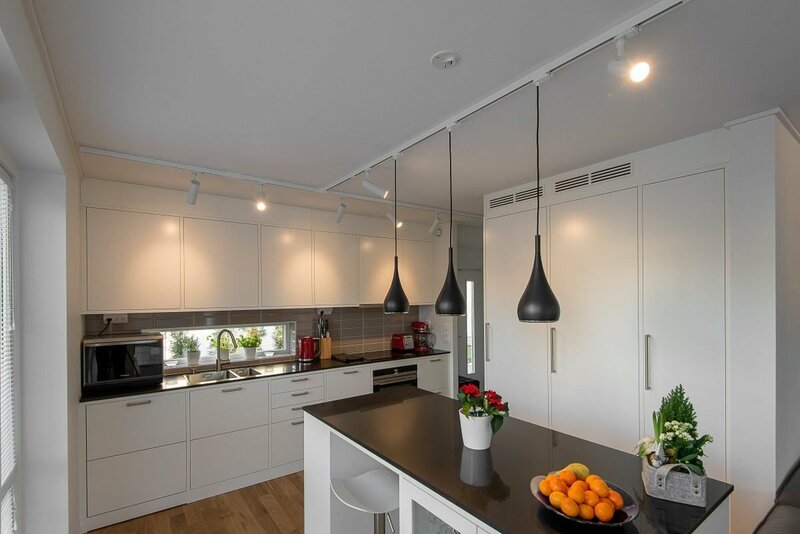 A combination of different lighting products can help create a unique and versatile kitchen lighting design that corresponds to your lifestyle. Linear lighting is the modern-day version of a chandelier. It works as a functional centerpiece light for the kitchen and can be hung with suspension cables over the kitchen bench or placed over the main floor. Because it is such a focal point, the colour finish can be customised to complement the interior design. The lights themselves come in a choice of cool white for brighter task-focused activities (like homework) or warm white for relaxation. Track lighting can effectively be used as a centerpiece light above the kitchen floor or over the kitchen bench. The swivel functionality of this type of lighting means that different focal points can be created in the room depending on whichever direction the individual lights are orientated. The standard finishes of the fixtures are black or white and the number of light fittings on the track can be increased to meet the needs of your space. Downlights are an excellent general lighting option for the kitchen floor. They can also be placed under cabinets to illuminate the working surfaces. Use of a narrow beam angle can create focus for these under-cabinet areas. Recess and mounted options of downlights mean they can be used with a variety of surfaces such as plasterboard, concrete, or timber. At L.E.D World we are lighting specialists who can translate your vision into a cost-effective and complete lighting plan for your kitchen. We can take your floor plan and suggest the most suitable lighting layout and product selection to fit your project goals. We work with a range of electricians across the country who know our products and offer competitive pricing for installation. Working with L.E.D. World can ensure that you are making the most informed decisions for lighting the all-important kitchen space.